For dinner, my BFF and I'd wanted to go to Ming Ge Café as we heard that the noodle dishes served by the eatery are pretty good. 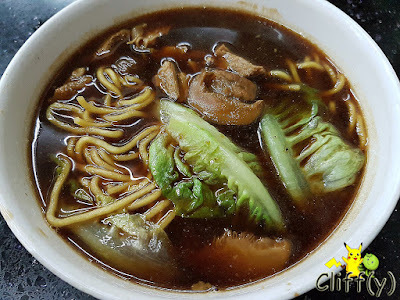 We then discovered that it actually opens from 6.30am to 2.00pm, sharing the same space with Da De Bak Kut Teh that operates from 4.00pm onwards on most days. 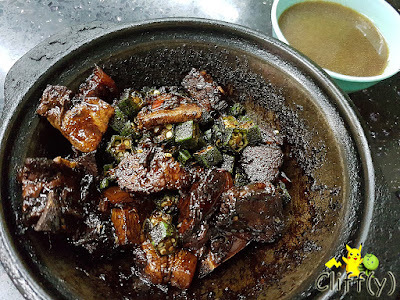 According to a few reviews online, the dry pork ribs dish is pretty good. 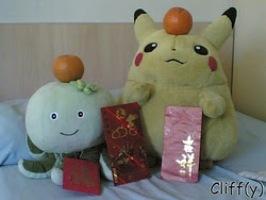 We only checked the Internet after our dinner though, so we were quite lucky that we didn't miss it. 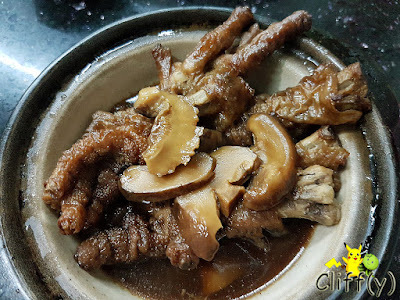 I wasn't particularly impressed with the eatery's rendition of chicken feet, which turned out to be somewhat soupy, given that the meat was a bit soggy and not gelatinous. The soup was mildly flavourful, while the mushrooms slices were quite juicy. Being a noodle lover, my BFF gave the noodle soup a try. Alas, both of us agreed that the soup wasn't that rich. It was certainly lacking in the herbal aroma I was looking for. The noodle was pretty springy though, while the pork ribs were adequately tender. I'm here to vouch for the dry pork ribs, pork belly and ladyfingers cooked in a claypot, which were full of flavours. The tender and juicy meat was lacquered with the caramel from the dark soy sauce with the petite ladyfingers providing a nice contrast in terms of texture. 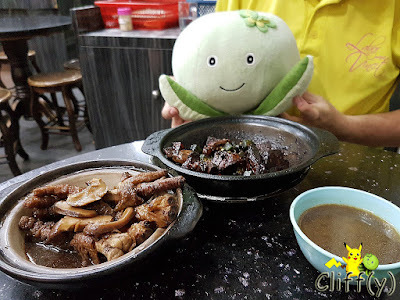 Pika's advice: If you're interested, you may want to try the Seafood Bak Kut Teh, containing fish and prawns, priced at RM 15.00 (~S$4.75) for the small portion. 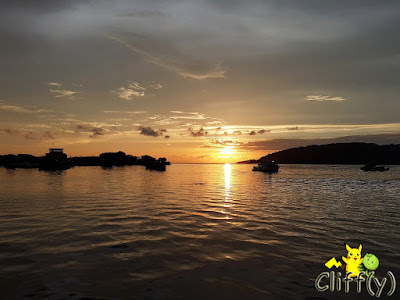 Here's a picture of the sunset at Kota Kinabalu for you to indulge in.